Last week was Dementia Awareness week, and here at Alzheimer’s Research UK Oxford Drug Discovery Institute we collaborated with the Oxford Health NHS Trust to put together a stall for a local science fair, organised by Living Well Oxford. Funded by Wellcome, the Living Well “pop-up shop”, entitled Ageing: From Birth and Beyond, took place in Templars Square Shopping Centre, Cowley. Living Well is a collaborative public engagement project between the Oxford AHSN, Science Oxford, and the Oxford Health Experiences Institute to support the exploration and understanding of health and healthcare. Scientists and organisations came together to offer practical advice and information on ageing and dementia, as well as a chance to understand the science behind getting older. There were many stalls giving families the chance to try activities designed to keep your mind and body active and healthy, plus special offers from fashion and beauty retailers on how to change your style as you age. Researchers from the Oxford Drug Discovery Institute and Oxford Health NHS Trust discussed their research and spoke to people about dementia, all facilitated through hands-on activities. 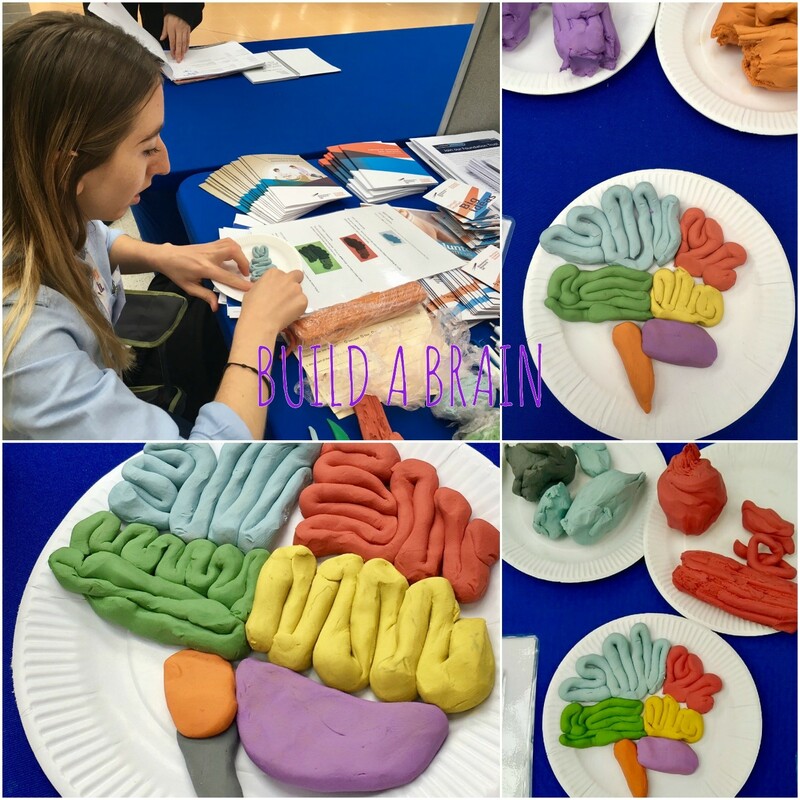 Our scientists got hands on with our build-a-brain activity, engaging members of the public to learn about the different regions of the brain by building a model brain using play-dough. This activity was great fun for both children and adults, and taught people about a healthy brain, what the different regions of the brain do, and how dementia affects the brain. Sea Hero Quest is a game which has been created by scientists at UCL, in partnership with Alzheimer’s Research UK, to help fight dementia by understanding more about how the brain navigates. Loss of navigational skills is one of the first symptoms of dementia. By playing Sea Hero Quest for two minutes, you can generate the same amount of data that scientists would take five hours to collect in similar lab-based research. Sea Hero Quest players sail the seas navigating mazes, shooting flares to test orientation, and chasing creatures to capture photos of them. This weekend, we were encouraging members of the public to play the game on our tablets, and download the game themselves. We also tested people’s memory using a simple memory card game, and both activities enabled our researchers to discuss the changes in memory and spatial navigation, which can signal early signs of Alzheimer’s Disease. To find out more about Sea Hero Quest, please visit the Sea Hero Quest Website. 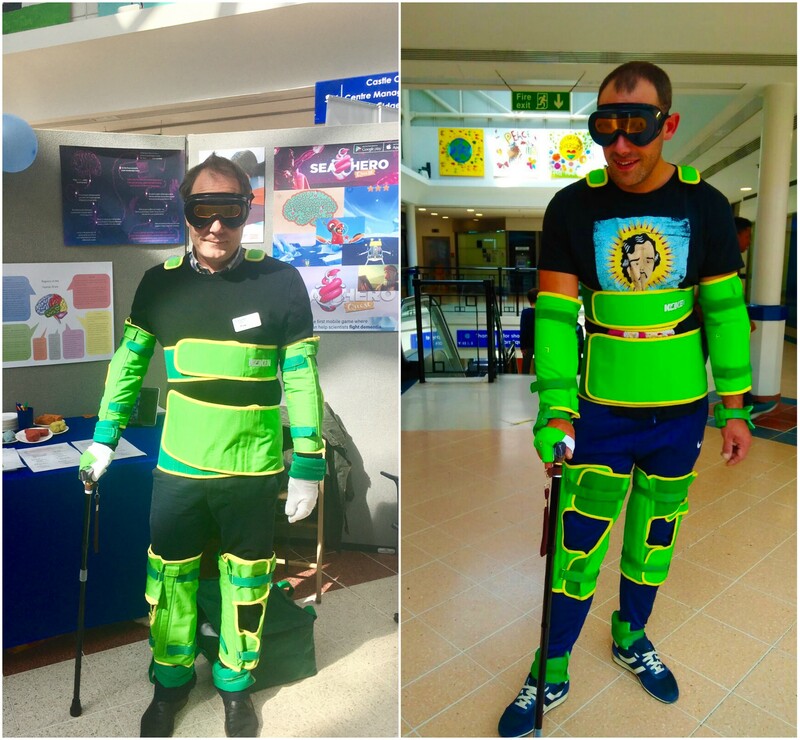 The age simulation suit lets you experience the inconveniences in day-to day life from the physical changes brought by ageing. As people age, they experience changes in posture, movement, and their senses. The posture becomes more stooped and the joints also change, making movement unsteady. This immersive activity alters the wearer’s perspective, allowing the wearer to better comprehend the physical condition of an elderly person. The weekend was a huge success, and our team had great fun engaging members of the public on topics relating to ageing and dementia through immersive, hands-on activities. We look forward to our next public engagement event! Find out more about the pioneering research the charity is funding across the UK.